Henry Alexander Dinges was born in 1839, the son of James Dinges and Elizabeth Bradford Dinges. His parents were married 11 October 1835 by John B. Davis, the pastor of Stephensburg’s Lutheran congregation at the time. By 1850, when the Federal Census was taken, James was listed as a 38-year-old farmer. His wife Elizabeth was 37, his daughter Mary Elizabeth was 13, and Henry was 10. There were three younger brothers named John, James, and George who were respectively 8, 4, and 2 years old. Another brother named David C. would be born two years later around 1852. 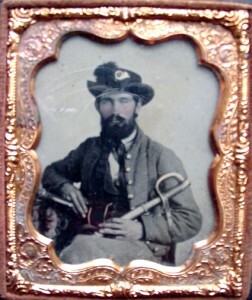 According to T. K. Cartmell, in his work Shenandoah Valley Pioneers and Their Descendants, Henry’s family was distantly related to an elder David Dinges, the patriarch of the only other Stephensburg family at that time with the Dinges surname. Cartmell states that David Dinges, Sr. came from the Woodstock area of Shenandoah County. Henry’s mother’s family, the Bradfords, had stronger roots in Stephensburg. By the outbreak of the Civil War Henry Dinges was 20 years old. He enlisted in the Confederate Army on 19 April 1861. He joined Company A of the 1st Virginia Cavalry and served under Colonel James H. Drake as a 1st Corporal. This cavalry unit was mostly composed of men from Stephensburg and Middletown. It included David W. Rosenberger, a short-term tenant of the stone side of the Stone House who was mentioned elsewhere, and Henry Dinges’ future brother-in-law Milton B. Steele. A little over one year after enlisting, Henry was sick with dysentery at a hospital in Richmond. After returning to duty on 6 June 1862, he was one of several men from Company A wounded in the skirmish at Raccoon Ford, Culpepper County, Virginia, on 11 October 1862. After returning once again to duty he continued to serve with Company A through the rest of the war until he was paroled in Winchester on 26 April 1865. Historical records describe 25-year-old Henry as having a fair complexion, light hair, and blue eyes. A photograph of Henry, taken during the war years, (above) which is in in our museum’s collection shows him with a medium-length full beard and mustache. Shortly after returning to civilian life he purchased the log side of the property on 30 July 1867 and then married Philoma (“Lomie”) Jane Steele 3 December 1867. He was 28, and she was 26. Lomie was the fourth child and third daughter of Mager and Eliza Kern Steele. Mager, Lomie’s father, was a successful merchant, Justice of the Peace, and patriarch of the Stephensburg branch of the Steele family. Lomie was also the older sister of Mager William Steele and his brother Milton Boyd Steele. Mager and Milton would later be partners in the firm of Steele & Bro. and the next owners of the stone side of the property. The price Henry paid for that log side of the duplex was $125, just $25 more than Jacob Shryock had paid for it when he purchased it in 1860 from the trustees of the Redd family. The 1870 census indicates that Henry was working as a farmer during those first years of his marriage. Henry and Lomie were living in the log side of the Stone House when their one and only child, a girl, was born in 1871. Baby Inez R. Dinges only lived until 1872. The next year Henry went into business with Lomie’s 20-year-old brother, John Magill Steele, the youngest child of Mager and Eliza Steele. The store they operated for the next 33 years was located on the southwestern corner of Main and Marlboro Streets at 5405 Main, the future location of the Flower Center in Stephens City. We now know that Henry and Lomie made some improvements to the log side of the Stone House during the period they owned the property. When they sold it in 1879 to Branson and Eliza Argenbright, the sale price was $565. That is $440 more than Henry paid Jacob Shryock for the property twelve years earlier. This increase in the property’s value reflect the fact that the lean-to shed addition, and possibly the underground cistern and kitchen addition on the rear of the log side of the house were added during the Dinges family’s period of ownership.